For months I tested out several different cleansers and nothing seemed to work. I decided to try out a product which I have heard superb reviews on and it is the philosophy's award-winning cleanser: purity made simple 3-in-1 cleanser for face and eyes. WOW! What a difference. Not only did it clean my face without any reaction but the fact that it did a serious job at clearing out ALL the makeup, including the eyes! Normally, I would use a cotton pad to wipe everything off before rinsing. Instead, all I did was massage the product onto my face for 30-60 seconds and as it was lathering it also removed everything. No more extra steps (no need for toner!) and wasting cotton pads! It really made my routine a lot easier. Not only did it leave a cleansed face but also a soft, toned and hydrating face! I found my replacement makeup cleanser! 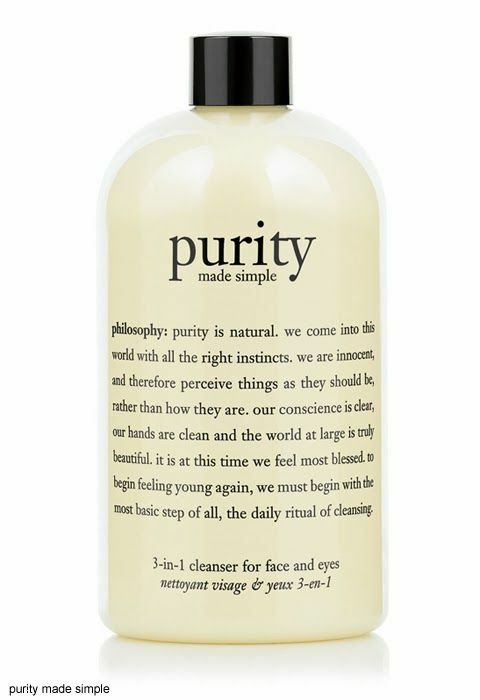 Super impressed by purity. I total recommend this product to everyone!